Will the Demand for Change Trigger a Reinvention of the Fund of Hedge Funds Model? Since the Global Financial Crisis, fund of hedge funds managers have struggled to define their role within the wider hedge fund industry. 2016 has been another difficult year so far, as negative sentiment around hedge funds in general continues to invite further scrutiny of the structure of multi-manager funds and their ability to meet the increasingly high demands of investors. Preqin’s Hedge Fund Online currently tracks 2,180 fund of hedge funds vehicles across 693 fund of hedge funds managers globally, down from 722 managers in operation as at Q4 2015. The chart above highlights the ongoing trend seen within the fund of hedge funds industry of the number of fund launches declining significantly each year, particularly over the past three years. Additionally, the number of fund liquidations has been more than double that of fund launches over the previous two years, symptomatic of today’s challenging fundraising environment. Moreover, funds of hedge funds are finding it difficult to build momentum with regards to performance: the Preqin All-Strategies Fund of Hedge Funds benchmark has posted losses of 1.17% for 2016 so far, lagging significantly behind the Preqin All-Strategies Hedge Fund benchmark (+5.48%). 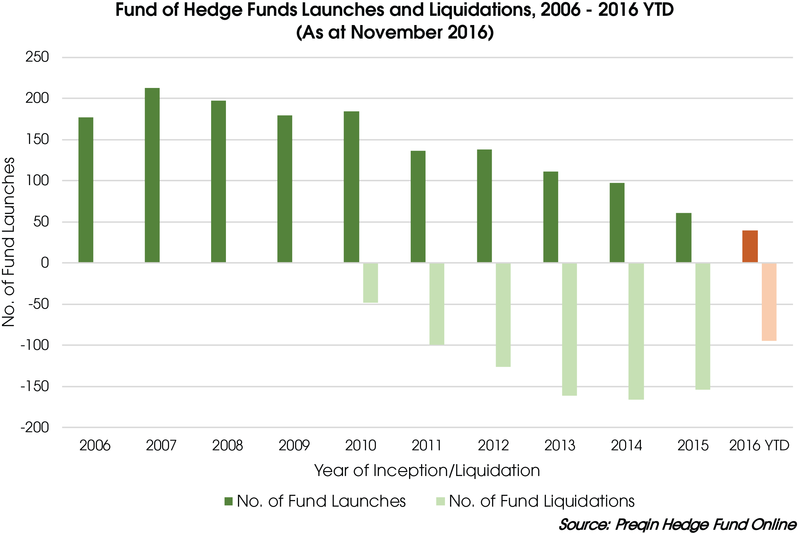 The high number of liquidations in recent years shows that fund of hedge funds managers are finding the current environment challenging, and for some, consolidating their firm is a route forward. For example, 2016 saw EnTrust Capital and Permal Group merge to create EnTrustPermal, and Fiera Capital completed its acquisition of Larch Lane Advisors. This activity followed the high-profile acquisition of Arden Asset Management by Aberdeen Asset Management at the end of 2015. One trend seen within the industry over recent years is the pivot away from commingled products and towards solutions-based services – another reason for the slowing rate of fund launches. Now more than ever, fund of hedge funds managers need to offer more in the way of customized solutions, managed account platforms and separately managed account services, with the increased flexibility helping to insulate fund of hedge funds managers from criticism of fee structures. Alongside these developments, further education on how these services can be of use is required in order to realign manager and investor interests. Over the coming years, the industry has an opportunity to reinvent itself and reassess how best to serve investors. The hedge fund industry in general has been on the receiving end of some heavy criticism in recent years, as institutional investors feel that the fees being charged by managers are not justified by the subsequent risk-adjusted returns. Indeed, according to Preqin’s H2 2016 Investor Outlook, institutional investors have highlighted fees and performance as the two key issues facing the industry. It is therefore understandable that investors would demand more for the double layer of fees being charged by fund of hedge funds managers. At a time when managers must go above and beyond to secure their place in investors’ portfolios, solely providing access to top hedge fund managers and diversification benefits may not be sufficient to meet the ever-increasing demands of investors.